QUARTER FINALIST IN THE AMAZON BREAKTHROUGH NOVEL AWARD 2013 – ROMANCE CATEGORY! Nearly 1,400 years ago, a king was buried in a treasure-filled longship on the banks of the River Deben in Suffolk, England. It is the burial site of Raedwald, the charismatic king of the East Angles. This is the story of his daughter, Raedwyn. It is 624 A.D. and Raedwyn has just been married to one of her father’s ealdormen. The marriage is a political alliance, rather than a love match, and on her wedding night Raedwyn realizes that her new husband is a callous brute. A bleak future awaits her. Yet, wyrd – fate – has other plans for Raedwyn the Fair. Outlaws ambush her new husband’s party on their journey back to his longship and Raedwyn finds herself captive of a bitter, vengeful warrior – Ceolwulf the Exiled. Ceolwulf has a score to settle with King Raedwald and Raedwyn is his bargaining tool. Caelin, Ceolwulf’s enigmatic son, follows his father on his quest for revenge. Fiercely loyal to her own father, Raedwyn isn’t prepared for her wild attraction to Caelin, or for its consequences. Their passion is forbidden. If Raedwyn and Caelin give in to it, they not only risk losing each other, but their lives. 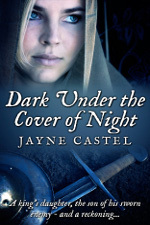 A gritty tale of revenge, honor and love, Dark Under the Cover of Night is for all those who enjoy timeless love stories. In Anglo-Saxon England, the warrior and the sword rule. In such a world, does Raedwyn and Caelin’s love stand a chance? If you like stories about revenge and honor, and enjoy exciting, well-researched historical novels, you will love Dark Under the Cover of Night. “Come Wuffa, come!” the child’s voice echoed out across the stableyard. The object of her attention – a tiny puppy with floppy ears, a soft brown coat and mischievous eyes – glanced back at his mistress. Then, willfully ignoring her, he put his head down and barreled toward the gates. “Wuffa!” The little girl raced down the steps leading from her father’s hall and tore across the wide expanse after her puppy. Her blonde curls flew out behind her as she ran, dodging men and horses, over hard-packed earth and through the gates that led out into Rendlaesham. Ahead, she caught sight of a scrap of brown heading straight toward the rear town gates. The girl picked up her skirts and dashed after her birthday gift. Ahead, the town gates loomed. It was nearing dusk and the gates were still open, allowing in folk returning from the orchards and fields behind the Great Hall. Her parents would be annoyed if she left the confines of the town without an adult present, but the fear of losing Wuffa was greater than that of a growling from her father. She ran across the wide road that circuited the town walls, and into the apple orchard. The orchard was vast; a wide swath of leafy trees that covered one side of the shallow valley behind Rendlaesham. Close to tears, for she could no longer see her quarry, the girl called out as she wandered down the narrow lanes between the trees. Eventually, distraught and frightened, the girl began to cry. Wuffa had only been hers a day, but she already loved him so. The thought that she had lost him made the little girl’s heart feel as if it were breaking. A boy, a few years older than her, stepped out from behind an apple tree. He was thin and sharp-featured with a mop of dark hair that flopped over his eyes. In one hand he held an apple with a bite out of it, and in the other he held her precious puppy. “Yes!” the girl rushed forward and the boy released Wuffa into her arms. The puppy eagerly licked her tear-streaked face and wriggled excitedly. He liked this game. “Naughty, naughty Wuffa!” she chastised him as he wriggled into her neck. “I’m four,” she announced proudly, her cheeks coloring when he laughed. “How do you know my name?” the girl wiped away any remaining tears with the back of her arm and struggled to keep ahold of Wuffa, who was now trying to wriggle out of her grasp. Caelin threw aside the half-eaten apple and relieved Raedwyn of the wriggling pup. The two children slipped inside the town gates and made their way along the dusty street that led up to the Great Hall. Dusk was settling over the town and amber streaked the pale sky. It had been a hot day, one of the most beautiful of the summer. Caelin and Raedwyn entered the stableyard and stopped in their tracks as a tall, handsome man with a mane of golden hair and dark blue eyes strode toward them. Caelin nodded, seemingly struck mute in front of his king. King Raedwald sighed and smiled down at his young daughter. Raedwyn clutched her precious puppy to her flat chest and, with a darting glance of thanks to Caelin, took off up the steps toward the Great Hall. Raedwald watched her go before turning back to the boy before him and grinning. When Caelin merely stared back at him, uncomprehending, the king shook his head. You can buy Dark Under the Cover of Night from the bookstores listed below.